The Mekong-Lancang Cooperation should promote its important role in boosting efforts by member states to scientifically and sustainably manage and use the water resources of the Mekong River, known as the Lancang in China, said Deputy Prime Minister and Foreign Minister Pham Binh Minh. Participating leaders launch Mekong-Lancang Cooperation. In his speech delivered at the first Mekong-Lancang Cooperation (MLC) leaders’ meeting which kicked off in Sanya city of China’s Hainan province on March 23, Minh hailed the significance of the meeting as it marked the birth of a new cooperation mechanism between Mekong-Lancang countries and the first time all six countries along the Mekong River met to discuss joint efforts for sustainable development in the Mekong sub-region. He noted that the Mekong sub-region is currently facing numerous challenges on development and security, particularly those related to environmental degradation, water resources and climate change. Vietnam welcomes and highly appreciates China’s recent decision of increasing the release of water in the upper Mekong River to address the severe drought and salt intrusions in the lower part of the river, Minh said, adding that the decision reflected a good start for the Mekong-Lancang Cooperation mechanism. The Deputy PM stressed Vietnam supports the principles and long-term collaboration orientations as specified in the Sanya Declaration, accordingly the Mekong-Lancang Cooperation was built on the principle of consensus, equality, mutual benefit and respect for the UN Charter and international law. Minh expressed his belief that with these principles and orientations, the MLC will help reinforce the good neighbourly relations among the six countries, and help them implement the UN’s sustainable development goals until 2030, and contribute to deepening the ASEAN-China strategic partnership. 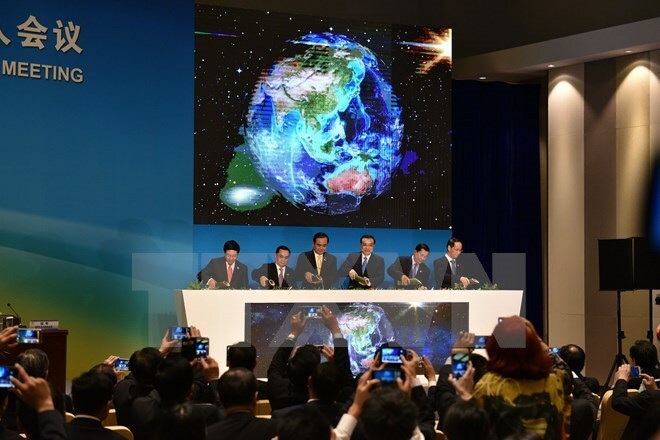 In his speech, Minh affirmed that a completed and connected infrastructure system is essential to the development of trade, investment and tourism in the Mekong sub-region. The MLC will contribute to boosting economic connectivity in the sub-region, through development cooperation and infrastructure linkage, he said. As economic connectivity is a priority for the ASEAN Community and the ASEAN-China strategic partnership, Deputy PM Minh said Vietnam backs the strengthening of production collaboration among Mekong-Lancang countries to increase competitiveness of each member and boost production chains linking economies in the sub-region and linking them with their partners. At the same time, the Deputy PM noted that cooperation in water resources is of leading importance among five priorities of Mekong-Lancang Cooperation. He said Vietnam agreed to work with China in developing a joint project to establish a centre on Mekong-Lancang water resources cooperation, adding that Vietnam is also ready to make financial contribution to the establishment and operations of the centre. The Deputy PM went on to say that agriculture plays a crucial role for the stability and sustainable development of Mekong-Lancang nations. Vietnam is willing to coordinate with other countries through stepping up the application of new technologies, increasing productivity, and forming agricultural value chains in the sub-region, towards a sustainable agriculture that is competitive and adaptable to climate change, thus ensuring a harmony between food security and water resource security. Trade, investment and tourism cooperation and connectivity is also a driving force for economic growth of countries in the sub-region, Minh confirmed. Therefore, Vietnam will intensify collaboration with other Mekong-Lancang nations to facilitate the cross-border movement of trade, investment and tourism through simplifying and harmonising administrative procedures. He concluded his speech by stating that the MLC is an open cooperation mechanism that can supplement current collaboration frameworks in the Mekong sub-region and create more added value for the cooperation among six Mekong countries. He underlined the need for the MLC to harmoniously coordinate with other cooperation mechanisms and frameworks, especially the Greater Mekong Sub-region (GMS) and the Mekong River Commission (MRC). The Mekong-Lancang countries are China, Thailand, Cambodia, Laos, Myanmar and Vietnam.